Evoque: 21 things you didn't know | What Car? • It has an aluminium bonnet and roof, plastic front wings and a composite tailgate to keep weight down. The lightest version comes in at less than 1600kg. • It is the first SUV or crossover with magnetic ride. Iron filings in the shock absorber fluid change their positioning when an electrical current is applied or removed to make the suspension stiffer or softer. • It has the best take-off, departure and ramp angles of any compact 4x4 or crossover, which means it can tackle steeper gradients and humps. • Engineers spent 13,000 hours making every shutline (the necessary gap between two adjacent body panels or interior trim panels) as tight as possible in the interests of refinement and quality. • The five-door version has a higher roofline and longer windscreen to make it more spacious in the back than its three-door sibling. • The Evoque is based on the Land Rover Freelander platform, but it has totally new front- and rear suspension. There is only one common chassis component between the two cars. 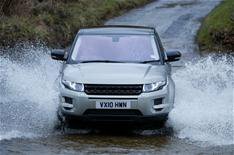 • The Evoque has more ground clearance than a Freelander and can drive through water that's up to 500mm deep. • An updated version of Land Rover's Hill Descent Control and Gradient Release Control is said to make driving down steep inclines smoother and prevent the car from rolling backwards at more than 5mph. • Durability testing took place in 15 countries and included China for the first time. Russian winters and Tokyo traffic were also included in the test schedule. • The 2.0-litre petrol engine develops 3.5% more power (237bhp) and 7% more torque (251lb ft) than the 3.2-litre six-cylinder unit in the Freelander, but it's 8% more economical. • The 2.2-litre diesel will be available with 188bhp or 148bhp. The lesser-powered version will be reserved for the two-wheel-drive model to help trim CO2 emissions to below 130g/km. • An eight-inch dual-view screen will allow the driver to use the sat-nav while the front passenger watches the TV or a DVD. Eight-inch rear screens mounted in the backs of the front headrests will also be available. • The range of personalisation options means there are 380,000 combinations available to buyers. • The Evoque was developed with what Land Rover calls 'life-cycle design' to take into account its effect on the environment at all stages of production, use and scrapping. The company claims this has reduced the car's global warming potential by 8.1%, saving 3.6 tonnes of CO2 over 125,000 miles. • There is 16kg of recycled plastic in every Evoque, which is used for such things as wheelarch liners and engine covers. The headliner is made from 100% recycled polyester. Altogether, there are 21kg of natural and renewable materials in the car. • Land Rover thought about giving the Evoque the familiar Range Rover split tailgate, but rejected the idea because that would have necessitated the use of heavier materials. • For winter mornings you will be able to programme the heater to come on before you get in the car to take the chill out of the cabin and for up to seven days in advance. • A self-park system steers the car into gaps only 1.2 times the car's length. All the driver has to do is work the accelerator and brake. • The Evoque is the first Land Rover with electronic power steering. This cuts fuel consumption by 2%. • A premium Meridian stereo with 17 speakers will be among the options available.